Equalizing thrust bearings are specifically designed to accommodate a certain degree of static misalignment before a load is applied. This misalignment is typically due to housing and bearing machining tolerances, or misalignment between the shaft and housing. This is static misalignment because the misalignment exists before a thrust load is applied. In certain conditions there can be an additional misalignment that occurs while the machine is operating. This means that the bearing is loaded and then misaligned as opposed to misaligned then loaded as explained in the previous newsletter (http://www.kingsbury.com/etb-misalignment). The misalignment described here is not due an out of square collar or a bent shaft which would cause a swashplate effect every revolution. Misalignment requires the standard leveling plate mechanism shown in Figure 1 to overcome tangential frictional forces which impede sliding. These forces are low during the initial loading process allowing the plates to shift as needed. The forces are high when the bearing is fully loaded; consequently, the plates do not perform as efficiently. The pin type equalizing system shown in Figures 2 & 3 is better suited to accommodate additional misalignment when the bearing is loaded. The pins provide a rolling contact that eliminates frictional resistance. This type of leveling plate design greatly improves the ability of the bearing to respond to additional misalignment especially when the bearing is heavily loaded. 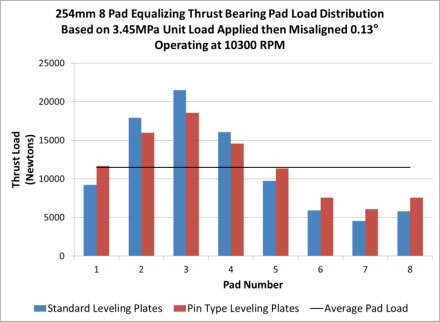 Figure 4 shows an example of the load distribution among the pads for the pin type and standard leveling plates when the bearing is loaded to 3.45MPa and then misaligned 0.13°. 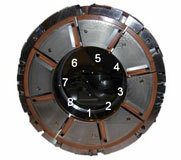 Figure 5 show the position of the pads in the bearing. The horizontal line in Figure 4 is the average load per pad. Under the same loading conditions, Pad 3 for the pin type has a lower load than the standard leveling plates. Conversely, pad 7 for the pin type is carrying a higher load than the standard leveling plates. This demonstrates a better distribution of the load for the pin type leveling plate design. Thrust bearings with a standard leveling plate system equalize the thrust load very well when statically misaligned and then loaded. For most industrial machines, this is all that is required of the equalizing thrust bearing. When an additional misalignment force exists due to the nature of the application or occurred over time, a pin type leveling plate design is a good alternative. For more information on how Kingsbury can service and improve your existing bearing application, please contact our Repair & Service sales engineers at +1-215-956-0565 or send an e-mail to: repair@kingsbury.com.